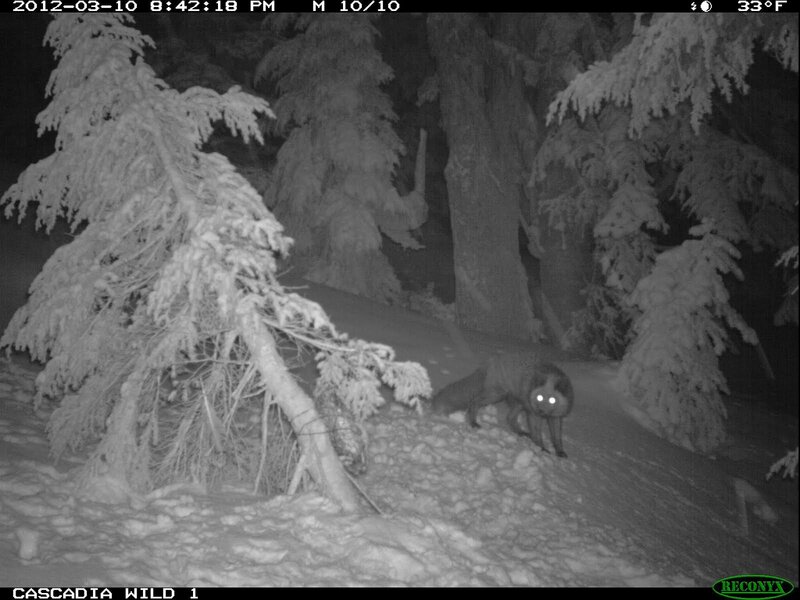 Photo from Cascadia Wild: A red fox photographed by motion-detecting infrared camera in Mt. Hood National Forest. The fox is thought to be a Sierra Nevada red fox, which hasn’t been found in Oregon in decades. With an invisible flash of infrared light across the snow, motion-detecting cameras in the mountains of Oregon may have snapped evidence of a nocturnal fox not seen in the state in decades. These new photos provide hope for the survival of one of the rarest animals in North America. Although the photos clearly reveal some kind of red fox, environmentalists still need to confirm this is Oregon’s lost fox. “We are operating under the assumption that these are the Sierra Nevada red fox because it is the only montane red fox that occurs in the mountains of Oregon,” said Taylor McKinnon of the Center for Biological Diversity. Next, he explained, is genetic verification. To accomplish this, researchers will test saliva. By placing meat in bags as snacks near remote-controlled cameras, researchers hope to collect saliva samples while capturing additional photos. Prior to the Oregon photos, the only two populations of the Sierra Nevada red fox known to exist were in northern California. Only about 20 foxes are known in Lassen Volcanic National Park, and three more are known near Sonora Pass north of Yosemite. A recent petition for endangered species protection predicts that fewer than 50 foxes live worldwide today. Historically, the fox lived in the Cascade Mountains of Oregon and California. None have been sighted in Oregon in recent decades, although red fox tracks have been found in the mountains. Last fall, federal biologists using a remote camera in Crater Lake National Park photographed a single red fox. Now, similar cameras in Mt. Hood National Forest reveal at least 3 more foxes. Sierra Nevada red foxes are nocturnal, so they are rarely observed in the wild. The motion-detecting cameras used by the naturalist group Cascadia Wild near Mount Hood relied on infrared sensors to see the foxes in the dark. Because of the foxes’ low numbers, the Center for Biological Diversity petitioned the Fish and Wildlife Service for endangered species protection of the animals last year. The agency is currently evaluating whether these protections are warranted. Current threats for the foxes include inbreeding of the remaining populations, disturbance of their food source by forest management and agriculture, and territory invasion by non-native red foxes. The International Union for the Conservation of Nature lists red foxes as a whole as one of “100 of the World’s Worst Invasive Alien Species.” Other subspecies of red fox besides the Sierra Nevada thrive around humans, where scrap food and shelter are abundant. At the end of the last ice age, climate warmed and some red foxes moved to higher elevations. They slowly adapted unique features from foxes in the lowlands, much like a different breed of dogs. The Sierra Nevada red foxes can still interbreed with other red foxes, although they are unlikely to do so naturally. Although the new photos may raise the number of known groups of the rare foxes to four, each group remains geographically isolated from one another. Any population of a rare species is critical to prevent extinction, but foxes separated by large distances, especially with human disturbances in the middle, are unlikely to interbreed naturally. Still, news of previously unknown populations of a rare species is heartening for preservation groups. “The reason they are cool is because they are California and Oregon’s only native alpine fox,” concluded McKinnon. More background on the Sierra Nevada red fox is available from the California Department of Fish and Game.